People often forget to update SDR. So I created this autoSDR that can be automatically updated with a single click. Make sure you are a member of "Web Service Access" Group. You are NOT by default. 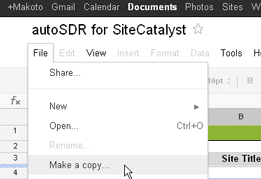 Get your "Shared Secret" which you can get from the Web Services section of the SiteCatalyst Admin Console. Click here to open the spreadsheet on Google Docs. It is being shared as a read-only doc, so you need to "Make a copy" for yourself to use it. Click "autoSDR" menu and select "Sign In & Update". Sign In using your Web Service Credentials. 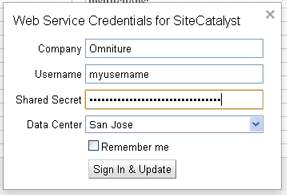 Shared Secret: You can get this from the Web Services section of the SiteCatalyst Admin Console. Data Center: Ask your admin or account manager if you don't know where your data resides. Remember me: Five items on this dialog can be saved in your personal profile. Wait until all the sheets are created with settings filled-in. If you have too many report suites, you can filter RSID. If the simple filter (partial match) doesn't work for you, create another user and grant access to a subset of report suites. Each update consumes four API tokens (number of RSID is irrelevant here). This is my personal project. No support is provided by Adobe Systems. This is what I needed when I was a customer with 100+ report suites. I believe every admin can enjoy this, so I am making this available to all. Enjoy!